Treatment of the damaged or carious molars often presents a set of challenges unique to the posterior dentition. Traditional dental treatments continue to be refined to improve the prognosis when treating the posterior dentition. Root canal treatment using calcium hydroxide as an antibacterial dressing has been reported to be successful in healing large abscess-like periapical lesions. The suggested treatment of periapical abscess with metapex followed by conventional root canal treatment of the involved tooth could result in complete healing of teeth which are initially considered hopeless or recommended for extraction. 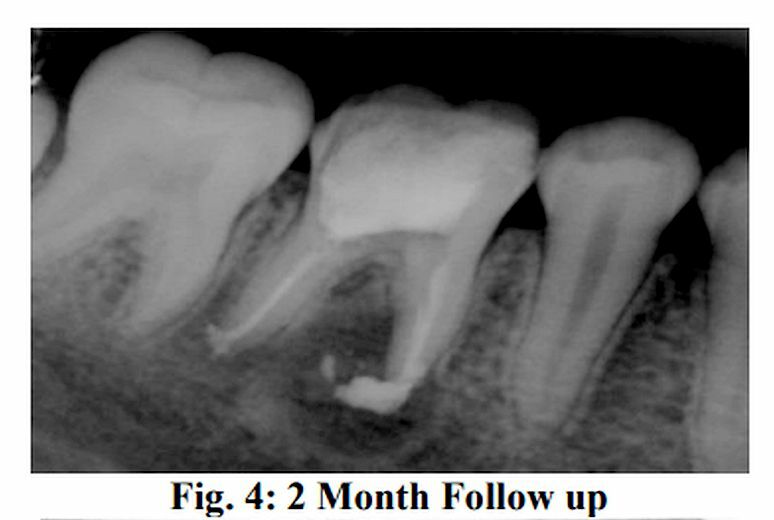 The article is to present a case report on the management of periapical abscess associated with mandibular right first molar utilizing metapex followed by conventional root canal treatment. The patient was evaluated after filling of canals with metapex every three months for one year. Radiographic examination on follow up showed healing of the defect as well as resolution of periapical radiolucency. Clinical evaluation also revealed reduction of tooth mobility. Non-surgical healing with metapex is a non-traumatic and cost effective option that can be employed in cases of periapical lesions. It is a good alternative treatment option in cases where peri-apical surgery is indicated.